Sunday, July 29th’s Fleet Doctor Bracket Points Race #10 has come and gone now. We saw the same incredibly tough competition that can be expected at any bracket race at Milan Dragway. One example of this is the fact that there were THREE .000 reaction times in the first round of Super Pro eliminations alone. To top the day off, we had the NHRA King of the Track run off. The four class winners ran in a shootout to see who was the King of the Track. Some people might think that this is setting some of the racers up for failure when you look at a pair like a Super Pro dragster racing a Sportsman car, but yesterday was proof of what we already knew: we have the toughest Sportsman racers around. The Sportsman guy took home the Wally. Greg McCurry lined up against Tim Buckley in the final round of the shootout. McCurry’s .012 to Buckley’s .015 gave him a good start, but the finish line can be tricky when one car is going 90 MPH and the other is going 147 MPH. Buckley crossed first breaking out by.003 meaning McCurry got the win. The Masta Performance Pro winner for the day was Johnnie Cook. Runner up Shelby Mangas had a great day of racing, but when it came time for the final round, it was Johnnie Cook’s day to take home the big check. Tim Buckley and Will Crawford faced off in the final round of Insurance Man Super Pro. A .009 reaction time from Buckley set him up for a good race against Crawford and got him the win. Buckley ran a 4.711 on his 4.69 dial in while Crawford ran 4.667 on his 4.66 dial in. S & S Customs Super Pro Motorcycle saw a first for the Mullendore crew when both Mike Mullendore and Dave Mullendore made it to the final round. They were going to be happy no matter who won, but only one could take home the win and the chance at the Wally. 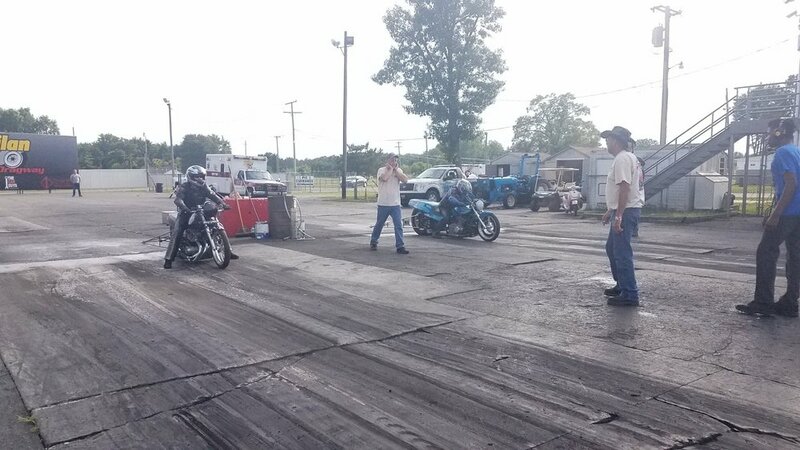 Dave Mullendore ran an 8.347 on his 8.34 dial in while Mike ran an 8.830 on his 8.82 dial. Mike’s better reaction time gave him the win over Dave. The McCormack Racing Sportsman final saw another family match up for the second time this season when Tyler and Greg McCurry lined up. It was anyone’s race off the starting line. Tyler left first with an .026 reaction time followed by Greg with an .027. Down at the finish line both drivers went faster than their dial in and Greg won on the double breakout. The points series has only two races remaining and we will soon find out who our 2018 champions are and start assembling our NHRA Division 3 ET Bracket Finals team AKA Team Milan for Indy. Stay tuned, this will definitely be a fierce chase for the championship.